20120507 - Up still sore and to the desk. Took a break and picked up G form school and ran to the bank and got us some lunch. When we got home G cut his foot on a sliver of glass and bleed like crazy. L was a the Dr. with GpaB for his knee replacement and G was hysterical. I got him settled, we ate and he played his iTouch until L got home. 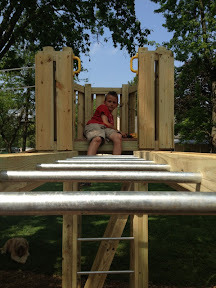 I had calls then walked out for some air and to make a couple calls and J was playing on his new playset, he loves it but his hands are too sweaty to make it all the way across the monkey bars :-) Back in to finish my day, then dinner with the fam. D&I did trash and J&G fed Lilly and then went with L back to see GpaB. D&I to Scouts. Home afterwards and out fast to Bible Bangers.